Excellent Physical Condition – The property is well maintained with mature landscaping and well-manicured grounds. Attractive Financing Optionality - The property is being offered free and clear of existing financing at closing, allowing investors the opportunity to take advantage of the aggressive capital markets with maximum leverage and low interest rates with short term bridge, long term debt, or interest only options available in today’s market. Strong Occupancy – Country Place has maintained above market occupancy year over year. Premier Location – With high visibility at the corner of Broomfield St. & Crawford Rd., Country Place is located within walking distance of Central Michigan University, three miles from US-27 and M-20, and six miles from both Pohlcat Championship Golf Club and the Soaring Eagle Casino & Resort. Market Position – Exceptional market conditions – residents are in the center of economic growth for the Mt. Pleasant area. Upside Opportunity – With the strong market occupancy, there is an opportunity to continue with organic rental rates increase and rent premiums through continued strategic interior apartment upgrades. Country Place is an exceptional rental community featuring 144 spacious apartments with a premier location just west of the area’s major employer, Central Michigan University. Constructed in 1989 and having received significant recent capital improvements, the property is in excellent physical condition. Situated on 12.53 acres, there are 10 beautiful buildings with a colonial style architecture of vinyl siding exterior with dimensional pitch shingled roofs. Country Place consists of 64 one-bedroom, one-bathroom units measuring 725 square feet, 32 two-bedroom, one-bathroom units measuring 933 square feet each, 32 two-bedroom, two-bathroom units measuring 940 square feet each, and 16 two-bedroom, two-bathroom units measuring 966 square feet. The average unit square footage is 844. Electric and gas is the residents responsibility and is individually metered. The landlord provides water, sewer, and trash removal. The property is beautifully landscaped with manicured grass areas, mature trees, colorful flower beds, and a beautiful pond. Encompassing 673 square miles in southeastern Michigan, Wayne County is the most populated counties among the six counties of the Detroit-Warren-Dearborn, MI Metropolitan Statistical Area (MSA). The area is one of the premier automotive manufacturing and foreign trade markets in the world, exporting over $30 billion annually in transportation equipment alone. Wayne County’s suburbs including Dearborn, Livonia, Westland, Canton, and Plymouth play an integral role in the county economy, serving as the home of many automotive assembly and parts manufacturing plants, health care facilities, and some of the top universities in the Midwest. Area suburbs provide residents with an outstanding quality of life, and easy access to world-class entertainment in both thriving downtown and local environments. 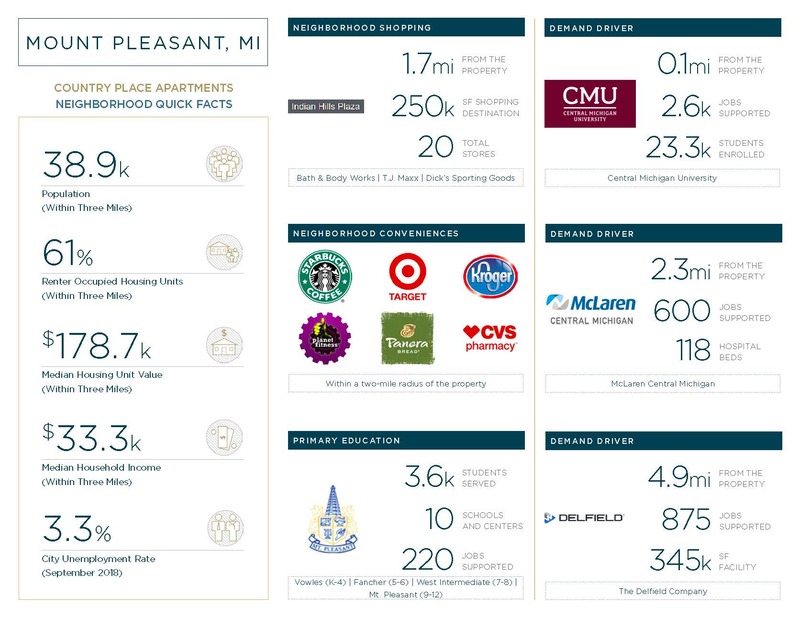 Cognizant of the area’s qualities and signiﬁcance to the U.S. economy, investors, entrepreneurs, and local companies have pumped over $12 billion into Wayne County businesses and property during the last decade.